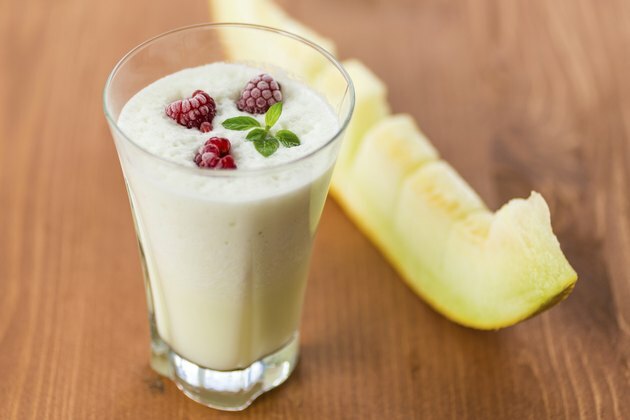 Weight loss shakes help a person lose weight by acting as a meal replacement. Instead of eating a meal high in calories, you are instructed to drink a calorie controlled shake filled with plenty of vitamins and minerals. Most diet shake manufacturers request that at least one meal of day be made up of solid food. Speak to your doctor about your plans to use weight loss shakes as part of your diet. Although plans vary, you typically consume two shakes per day on the diet plan along with a calorie controlled diet. Dinner should be made up of half vegetables and the other half lean proteins and starches. Instead of relying on only the shakes to lose weight, you can also consider the use of Slim Fast brand bars. The bars are also calorie controlled and used to replace one of your normal meals. Shake flavors include chocolate, French vanilla, cappuccino and strawberry. Each shake serving contains approximately 180 calories, 6 grams of fat and 10 grams of protein. For Medifast, you consume five meal replacements each day and one "lean and green meal." Your lean and green meal is made up of plenty of vegetables and a serving of a lean protein, such as chicken, turkey or fish. Besides weight loss shakes, meal replacement selections include soups, puddings, meal bars and oatmeal. Shake flavors are chocolate, strawberry, vanilla, banana and orange. You'll consume 90 calories, 1 gram of fat and 11 grams of protein per serving. Herbalife also offers a line of weight loss shakes. To prepare the shakes, you blend two scoops of the concentrated formula and one cup of fat free milk. To lose weight, you are instructed to drink two shakes each day and one well-balanced meal. When prepared with milk, each 8-ounce serving contains 170 calories, 1.2 grams of fat and 17 grams of protein. Flavor selections include French vanilla, wild berry, chocolate, café latte and cookies n cream. The Lean Shake from GNC's Total Lean line of products is marketed to individuals looking to lose weight and build lean muscle mass. You should drink two shakes daily, eat one nutritious meal and follow a regular exercise routine. To prepare, you add two scoops of the concentrate to 8 ounces of water and blend. Each serving contains 180 calories, 2 grams of fat and 9 grams of protein. Flavor choices include Swiss chocolate, vanilla and berry.